Each year, the FabricLink Network's Top 10 Innovation Awards showcase new textile products and technologies that are recognized as outstanding new developments that have been officially launched over the past year, and are commercially available. The research required to launch many of these advancements often extends over several years. The FabricLink Network's Top 10 Innovation Awards recognize the best technologies made by companies and universities throughout the world. This year's Top 10 winners include new apparel fibers, innovative insulation solutions for apparel and building construction, medical innovations, a building stabilization product, a textile polymer development for attach-and-release, and an optic sensing technology for geo-structures. We hope that the technical textile advancements of this year's winners will inspire future achievements in the global textile marketplace. CRAiLAR® Flax is the first sustainable natural fiber with the potential to revolutionize the textile industry. From the farms where the flax is grown to the mills where it's spun into yarn, CRAiLAR Flax Fiber reduces chemical and water usage, is designated as a 100% BioPreferred® product by the USDA and classed in Group B on the Made-By Environmental Benchmark. CRAiLAR Flax is a new, high-quality natural fiber which equates or surpasses the comfort of cotton, but exhibits performance characteristics similar to a synthetic. 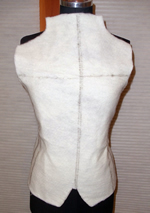 Because of its stiff structure, traditional flax fiber could only be woven into linen fabrics. However, through the use of CRAiLAR's all-natural, proprietary, enzymatic process, CRAiLAR Flax is able to be entered into all cotton and polyester spinning, knitting and weaving systems. CRAiLAR Flax is as soft and durable as cotton, yet showcases additional performance attributes. The fiber is strong, dries quickly, wicks moisture and is shrink resistant. It adds a soft, natural hand to both polyester and man-made cellulosics. The Edema Stocking, developed by Ohmatex in Denmark, is an electronic smart textile device that monitors and measures changes in leg volume for patients suffering from edema (fluid accumulation or swelling) of the lower limbs. The stocking was developed for patients with congestive heart failure where edema can be one of the first symptoms experienced. The stocking allows for daily monitoring, and as a telecare device has the potential to reduce out-patient visits and hospital admissions. The material of the stocking includes a sensor that instantly measures all changes of leg expansion. The measurements are sent via a mobile device showing the changes of swelling in the legs. This information is automatically sent to clinicians at the hospital for observation and medication can be adjusted accordingly. The stocking can also be used to monitor women suffering from pre-eclampsia in pregnancy. This is a serious condition, which causes retention of fluid and can ultimately put the pregnancy at risk. 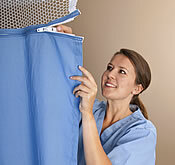 The Edema stocking can be used to monitor the condition in hospital or at home. Implantable, medical-device developers can now take advantage of a novel drug delivery system through TissueGen®, Inc.'s ELUTE™ biodegradable drug-loaded fiber — a breakthrough that expands the scope of drugs and biologics deliverable via implant. TissueGen has developed a patented, cutting-edge room temperature extrusion process for manufacturing drug-loaded fiber used in implantable medical devices, allowing the broadest variety of drugs and biologically-based entities possible to be delivered directly to targeted internal sites in a number of medical applications. TissueGen currently offers two types of ELUTE™ biodegradable drug-loaded fibers well suited for medical devices including woven, knitted, or braided medical textile applications: 1) Pharmaceutical Fibers, typically loaded with well-known pharmaceutical agents; and 2) Growth Factor Fibers, typically loaded with extremely sensitive therapeutic agents such as growth factors and ideally suited for advanced research applications. Medical applications include custom drug delivery, cardiology, dermal wound healing, peripheral nerve regeneration, sutures, vascular stents, grafts, orthopedics, and general surgery. Developed by the Karlsruhe Institute of Technology (KIT), this product is a composite of strong and stiff glass fibers, interwoven to create durable, elastic panels. The fibers crisscross in various directions, so they are both strong and pliable, allowing coverage to distribute energy evenly when the walls shake during an earthquake. Standard wallpaper glue is not enough to keep walls standing in the event of seismic activity. Therefore, KIT began working with Bayer's Material Science division to enhance the product. 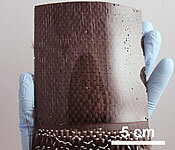 The result was a flexible, yet soft adhesive that contains water and polyurethane beads. The adhesive forms to the grooves in a wall's masonry, and as the water evaporates it boosts the wallpap's strength. The fabric was tested in a model home in an earthquake simulator, where the seismic wallpaper allowed the building to remain standing with little damage. The building material is expected to cost more than regular wallpaper, but builders and homeowners who live in quake-prone areas may find the product well worth the price in protecting structures, and saving of lives. Developed by scientists at the University of Massachusetts Amherst and currently by Felsuma LLC, which is now is commercializing Geckskin™, the new attach-and-release material replicates the feet of the gecko. Using van der Waals forces, the Geckskin fabric technology, made from fabrics such as nylon, Kevlar, or carbon fiber peels away easily on any surface, leaves no residue, and can hold up to 700 lbs. Geckskin combines two components, an elastomer (rubber-like materials) and a fabric, which creates both a soft and stiff material. Together these textile elements replicate the footpad of the gecko, where a tendon on the gecko's toes integrates with its skin, and is directly connected to a soft and compliant pad. Similarly, Geckskin employs both a synthetic 'tendon' and 'skin', which are interwoven in much the same way. Geckskin is anticipated to impact a broad range of applications including apparel, household hanging, and manufacturing assembly processes. Developed by TenCate, GeoDetect® is a combination of geotextile performance and fiber optic sensing technology to provide actionable information related to soil strain and temperature changes of geo-structures. Geotechnical professionals are constantly faced with uncertainty due to a variety of geological hazards to land development. Karst topography (the dissolution of a layer or layers of soluble bedrock), abandoned mines, liquefaction-prone soils, peat, loess (sedimentary deposits), and soft ground conditions hazards and the variability of soil and subsurface conditions. TenCate GeoDetect® is the "first intelligent geotextile" able to provide soil reinforcement, structural health monitoring, design validation and an early warning system into one package. Our solution is designed specifically for geotechnical applications and offers a technical solution for monitoring geo-structures for changes in strain and temperature. Applications include: Roads/Rails, Walls/Slopes/Embankments, Levees/ Embankment Dams/Canals, Landfills, and Pipelines. Developed by Ecovative, Mushroom® Materials are a new class of home-compostable bio-plastics, based on mycelium, a living organism analogous to the root structure of mushrooms. The biomaterials are high-performance and an environmentally responsible alternative to traditional polystyrene plastic foam packaging material, insulation, and other synthetic materials. Harnessing the power of nature, Mushroom Materials eliminate the pollution generated across the petroleum-based plastics supply chain. Mushroom Materials begin as plant-based farm waste and are fully compostable. This high-performance alternative to molded or fabricated EPS (Expanded Polystyrene or Styrofoam), EPP (Expanded Polypropylene), EPE (Expanded Polyethylene), performs like foam, but is renewable, natural, home-compostable, and environmentally responsible. Ecovative's scientists, engineers and product development team delivers innovative, sustainable solutions that perform across a variety of industries. PurThread Technologies' high-performance fabrics are embedded with an EPA-registered antimicrobial agent developed by Eastman Kodak. Using a patent-pending and TechAmerica Award-winning manufacturing process, the technology is incorporated into the fiber before it is spun into yarn and woven into fabric. This ensures the agent's even distribution throughout the fabric, maintaining its efficacy for the life of the product. The technology in PurThread fabrics is not a topical coating or superficial treatment, meaning the agent's properties won't wash away, weaken or wear out over time. Additionally, the antimicrobial agent–a form of silver salt–works to keep fabrics fresh by inhibiting the growth of odor-causing bacteria, mold, mildew and fungus on the materials that include it. PurThread's proprietary yarn is integrated into a range of textile products, harnessing silver's natural antimicrobial properties for stain control, odor control and product protection. PurThread is also investigating in cutting-edge research to explore potential public health benefits of silver-treated textiles. Qmilk, a biopolymer fiber manufactured by Qmilch GmbH, is a compostable fiber based on casein milk protein. The Qmilk fiber can be obtained both as a staple fiber and filament. Like wool and silk, Q-Milk is soft, gentle on the skin, antimicrobial, flame-resistant and non-allergenic. The 100% biodegradable Qmilk offers a wide range of fiber cross-sections, allowing applications in apparel, sports textiles, home textiles, technical textiles, and automotive. Since the fiber easily absorbs moisture, Qmilk is particularly suitable for applications in underwear, functional sports clothing, home textiles, and technical textiles. Tests have shown that Qmilk also offers natural UV protection. Its smooth silk-like surface makes it ideal for next-to-skin wear. Since the bacteria can't multiply in Qmilk fiber, apparel maintains an odor-free freshness. Qmilk takes color easily, and can also be colorized during the production process. Qmilk uses only natural and renewable raw materials, is free of optical brighteners, and creates zero waste from production through end-of-life composting. Wool offers natural evaporation and superior thermoregulation. Proven sustainable for the environment, naturally renewable and biodegradable. Wool fiber from America's soil to Hobbs USA. Processing and licensed finished garment assembly here in the USA establishes the carbon footprint nature asks of us.